**†LIFENOL® is a registered trademark of Naturex, Inc.
Non-medicinal ingredients: microcrystalline cellulose, silicon dioxide, maltodextrin, tricalcium phosphate, sodium stearyl fumarate. Capsule: hypromellose. AOR™ guarantees that all ingredients have been declared on the label. Contains no wheat, gluten, peanuts, sulphites, dairy, eggs, shellfish, or any animal byproduct. Raw material processed in a facility that contains nuts, sesame seeds, mustard, and fish. With phytoestrogens from flax, soy isoflavones, black cohosh, and the powerful 8PN from hops, Pro Fem Balance helps reduce symptoms of menopause, including: hot flashes, night sweats, and mood imbalances. It also helps reduce the risk of post-menopausal diseases. The primary symptoms of menopause include hot flashes and night sweats. Secondary symptoms can include anxiety, mood swings, depression, loss of libido, and vaginal dryness. 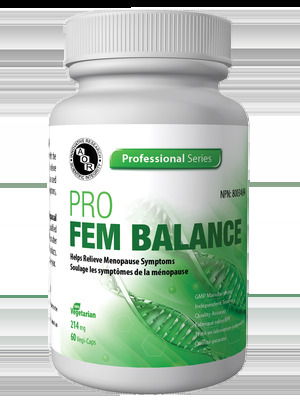 Pro Fem Balance can also be beneficial in pre-menopausal women suffering from menstrual migraines or other symptoms of PMS such as nervous tension and muscle or joint pain. AOR's Pro Fem Balance provides standardized, clinically tested, natural ingredients that have been demonstrated to safely and effectively alleviate some of the uncomfortable and undesirable symptoms associated with menopause. Adult Dosage: Take 2 capsules daily with/without food. Take a few hours before or after taking other medications or natural health products. Cautions: Ensure patients are up-to-date on mammograms and gynecological evaluations prior to use. Caution prior to use if individual is breastfeeding, taking blood thinners, have a history of hormonal or gynecological disease including ovarian cancer, endometriosis or uterine fibroids, have a liver disorder or develop liver-related symptoms (e.g. abdominal pain, jaundice, dark urine), are taking hormone replacement therapy (HRT) including thyroid hormone replacement therapy or have depression or related diseases. Discontinue use and reassess if individual experiences breast pain, discomfort or tenderness or if patient experiences a recurrence of menstruation and/or uterine spotting. Do not use if individual currently have or previously had breast cancer or breast tumours, have a predisposition to breast cancer as indicated by an abnormal mammogram, biopsy or have a family member with breast cancer. Consumption with alcohol, other medications or natural health products with sedative properties is not recommended. Some people may experience drowsiness. Exercise caution if operating heavy machinery, driving a motor vehicle or involved in activities requiring mental alertness. Hypersensitivity such as an allergy has been known to occur in rare cases, in which case discontinue use. Reassess if symptoms persist or worsen, or for use beyond 1 year. This product contains soy.